This Apollo III tapestry shows the work from a series of tapestries call the Triumph of Apollo. The originals were designed by Bernard van Orley, a Flemish painter in the Renaissance style (1487-1541), and were woven in the Leyniers manufactory. Van Orley was a painter in the Romanism style, a style developed by Dutch painters who visited Italy and incorporated the Renaissance style. Here we see Apollo, important in Roman and Greek mythology. He has been known to be the god of light, truth, healing, music and poetry. With his muses by his side, playing music and enjoying the countryside. 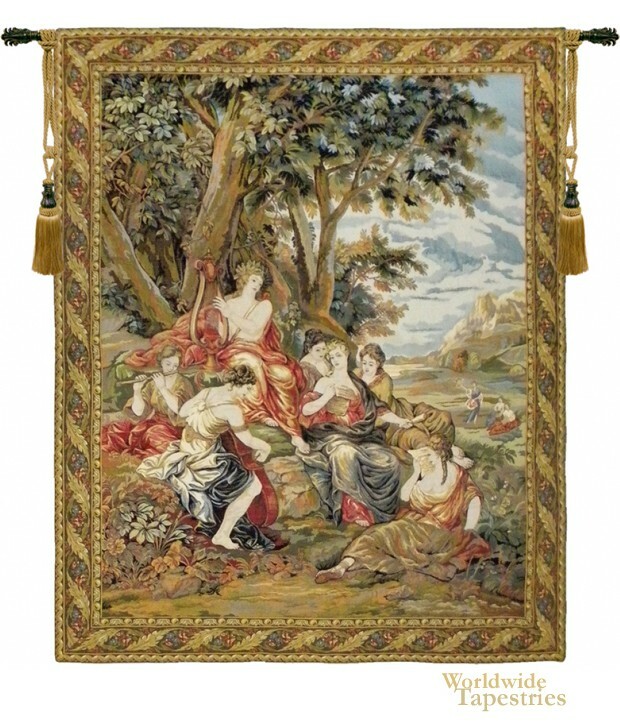 This Apollo III tapestry is backed with lining and tunnel for easy hanging. Note: tapestry rod and tassels, where pictured, are purchased separately. Dimensions: W 62" x H 72"